Times may change, but crimes never do, and neither do the people who investigate them.A collection of three loosely connected crime novellas, each set in a distinct era, Catalina Eddy is a gritty, hard-boiled exploration into the immutable police underworld of Southern California. In The Big Empty, an obstinate Los Angeles detective investigates the murder of his estranged wife while fears of nuclear war and Communism grip the nation; in Losertown, a mid-career attorney in San Diego chases down a legendary drug kingpin but chafes against the Reagan Revolution policies of his new boss; and in Portuguese Bend, set in the present day, an undercover cop is paralyzed in a gunfight but determined to solve what may be her last case as a police officer in Long Beach. 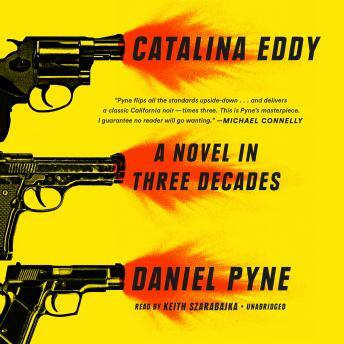 They are all, in one way or another, stuck in dreary endless loops of love, murder, and the quest for clarity, release, and redemption.Reminiscent of James Ellroy's grittiness and Raymond Chandler's dark wit, Catalina Eddy is Daniel Pyne's clever homage to-and skillful deconstruction of-traditional noir storytelling. Moody, enthralling, and keenly imagined, Catalina Eddy evokes the characters and ambiance of a singular, peculiar landscape with cinematic flair.